The Lodge features natural construction of local stone, hemlock, and cedar that seamlessly blend into the surrounding environment. Built to grade, The Lodge contains ten rooms and suites with a modern feel. The 1st Level features four spacious rooms with separate outdoor entrances, covered patio seating, and kitchenettes, while the 2nd Level boasts four deluxe rooms with private deck entry and seating, as well as a spacious shared common area with dining area, living room, and full kitchen. The east wing around the rear of the building (formerly Cottage Suites) houses two large suites with a separate entry for guests looking for more privacy – one suite features a full kitchen and living space and the other has two separate bedrooms with a shared coffee bar area, both of which are great for couples or family traveling together! 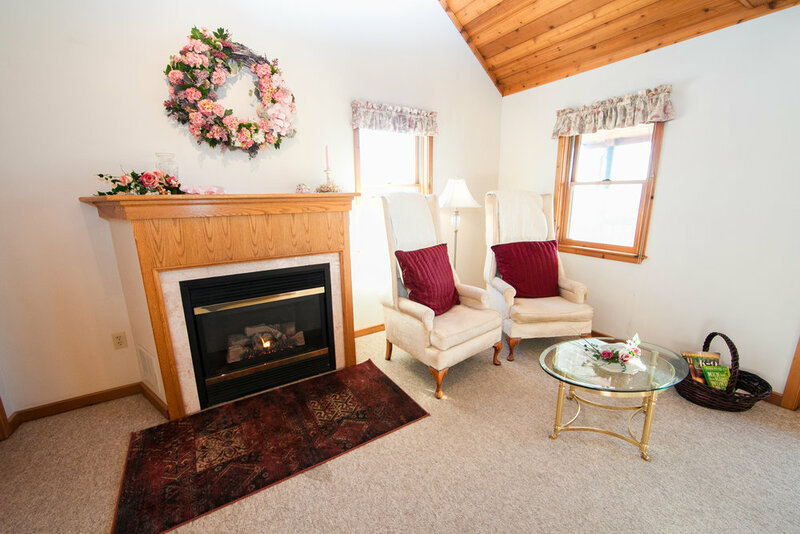 Located on the 1st level of The Lodge, our Fieldstone Room can accommodate up to 2 guests. This king bedroom has a private outdoor entry, window cafe table, two comfortable reading chairs, and a cozy gas fireplace. This room also features a stocked kitchenette area with mini-fridge, microwave, coffee maker, toaster, dishes, and silverware, which adds convenience and flexibility to the accommodation. The private in-room bath features a large mirror, twin sinks, and standard size shower/oval tub. 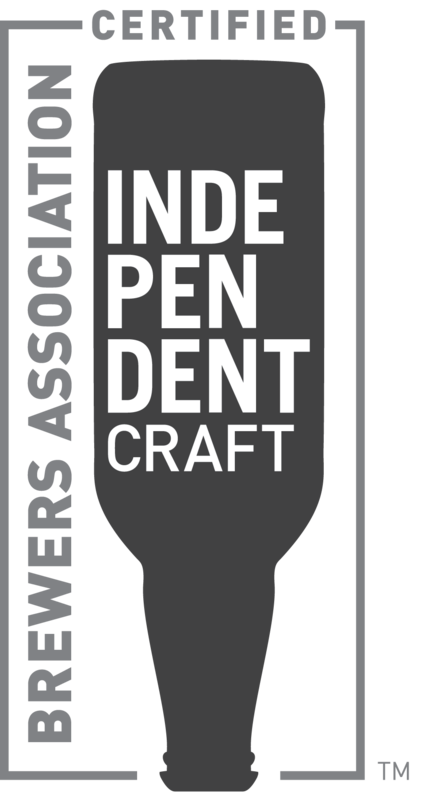 Three large windows add natural light and overlook Seneca Lake, and just outside the door on the covered porch are two Adirondack chairs – a great place to relax and enjoy a craft beer and a beautiful sunset over Seneca Lake. Located on the 1st level of The Lodge, our Carriage House Room can accommodate up to 4 guests*. The largest of our 1st level rooms, this king bedroom has a private outdoor entry and a sitting area with a reading chair and a convertible queen sleeper sofa foldout. 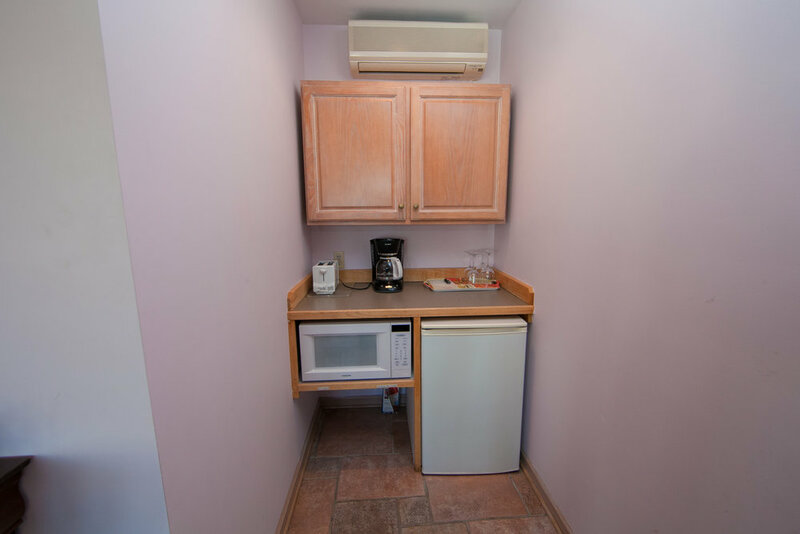 This room also features a stocked kitchenette area with mini-fridge, microwave, coffee maker, toaster, dishes, and silverware, which adds convenience and flexibility to the accommodation. The private in-room bath features a large mirror, twin sinks, and standard size shower/oval tub. 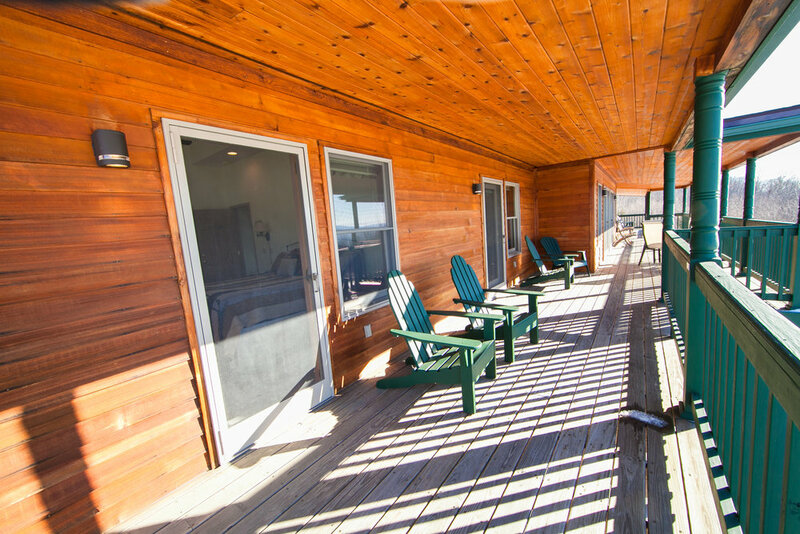 Three large windows add natural light and overlook Seneca Lake, and just outside the door on the covered porch are two Adirondack chairs – a great place to relax and enjoy a craft beer and a beautiful sunset over Seneca Lake. Located on the 1st level of The Lodge, our Bluebird Room can accommodate up to 2 guests. This bright king bedroom has a private outdoor entry, pine wood furniture, and an oversized reading chair. This room also features a stocked kitchenette area with mini-fridge, microwave, coffee maker, toaster, dishes, and silverware, which adds convenience and flexibility to the accommodation. The private in-room bath features a large mirror and a standard size shower/ oval tub. Three large windows add natural light and overlook Seneca Lake, and just outside the door on the covered porch are two Adirondack chairs – a great place to relax and enjoy a craft beer and a beautiful sunset over Seneca Lake. Located on the 1st level of The Lodge, our Hickory Room can accommodate up to 2 guests. This king bedroom has a private outdoor entry, dark cherry furniture, a large reading chair, and a gas fireplace. This room also features a stocked kitchenette area with mini-fridge, microwave, coffee maker, toaster, dishes, and silverware, which adds convenience and flexibility to the accommodation. The private in-room bath features a large mirror and a standard size shower/oval tub. Three large windows add natural light and overlook Seneca Lake, and just outside the door on the covered porch are two Adirondack chairs – a great place to relax and enjoy a craft beer and a beautiful sunset over Seneca Lake. 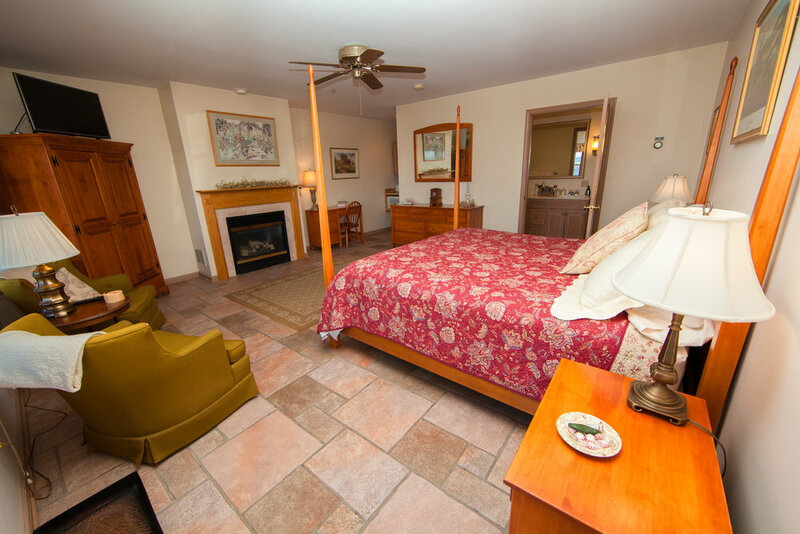 Located on the 2nd level of The Lodge, our Cedar Heights Room can accommodate up to 2 guests. This king bedroom features a gas fireplace, reading chairs, and high ceilings with a sky window that creates an open, light, airy atmosphere. The high ceiling continues into the private in-room bath complete with a standard size shower/oval tub. Directly off the bedroom is a large shared covered outdoor deck with seating, which can be accessed through a private in-room door. As an exclusive feature for all guests staying on the 2nd level of The Lodge, you have access to a large, shared common living/dining area with a flat screen TV and wood burning fireplace, as well as a fully-stocked kitchen for food prep and storage. Located on the 2nd level of The Lodge, our Pinot Noir Room can accommodate up to 2 guests. This wonderful high-ceiling queen room has French country-style furniture and soft pastels that add to the feeling of relaxation. 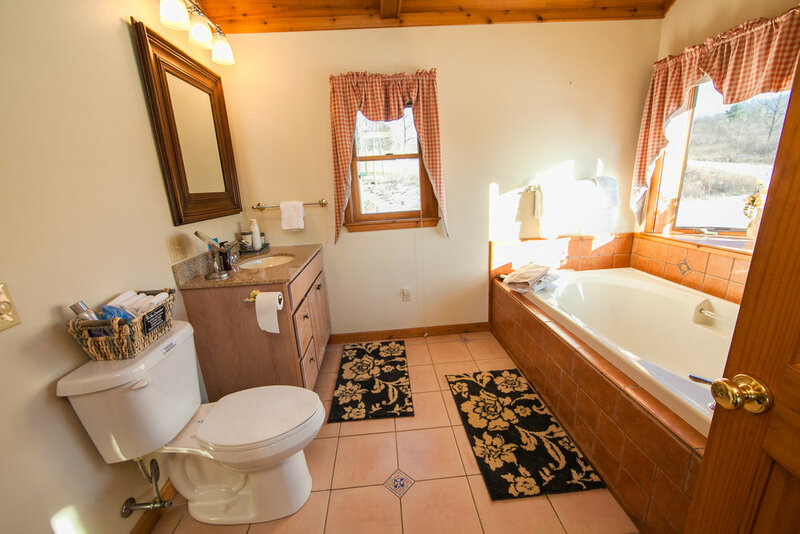 The privately-keyed bath for this room is located immediately across the hall and features a standard size shower/oval tub. Directly off the bedroom is a large shared covered outdoor deck with seating, which can be accessed through a private in-room door. As an exclusive feature for all guests staying on the 2nd level of The Lodge, you have access to a large, shared common living/dining area with a flat screen TV and wood burning fireplace, as well as a fully-stocked kitchen for food prep and storage. Located on the 2nd level of The Lodge, our Hummingbird Room can accommodate up to 2 guests. This charming high-ceiling queen room has pinewood furniture and a comfortable reading chair. 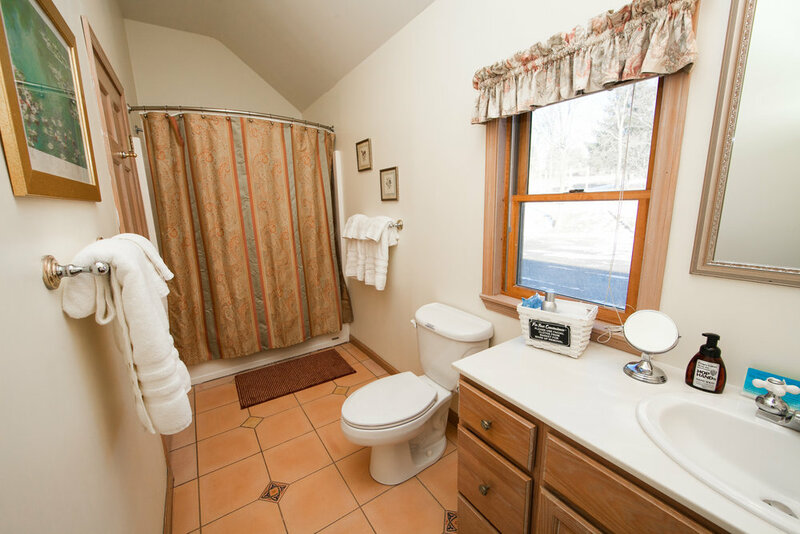 The privately-keyed bath for this room is located immediately across the hall and features a dual sink vanity and a dual-head standard size shower. Directly off the bedroom is a large shared covered outdoor deck with seating, which can be accessed through a private in-room door. As an exclusive feature for all guests staying on the 2nd level of The Lodge, you have access to a large, shared common living/dining area with a flat screen TV and wood burning fireplace, as well as a fully-stocked kitchen for food prep and storage. Located on the 2nd level of The Lodge, our Moonset Room can accommodate up to 2 guests. Our most popular accommodation for romantic getaways, this king bedroom features an open beam cedar ceiling, California Mission furniture, a seating area, gas fireplace, sky window, and French doors that lead to the large shared covered outdoor deck with seating and lake views. The in-room bath features high ceilings, a luxurious ceramic-tiled soaker tub with bay windows, and a separate shower. As an exclusive feature for all guests staying on the 2nd level of The Lodge, you have access to a large, shared common living/dining area with a flat screen TV and wood burning fireplace, as well as a fully-stocked kitchen for food prep and storage. Located in the east wing off the back of The Lodge, our Skyview Suite can accommodate up to 4 guests* and can be rented as a one-bedroom king or two-bedroom king and queen suite. This 2nd floor suite features a main king bedroom with two comfy oversized chairs and a vaulted ceiling and sky windows that provide ample natural light and great views of the surrounding hillsides. A small hallway connector features a coffee bar, mini-fridge, and closet, as well as the entry to the private, en-suite shared bath with a combination Jacuzzi whirlpool tub and overhead rain shower. At the other end of the hallway is the cozy queen bedroom with reading chair and dressing table. This suite is family-friendly for guests traveling with children.